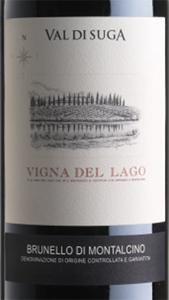 Brunello di Montalcino 'Vigna del Lago' by Val di Suga is made in the area the coldest part of Brunello, the last to be harvested. Historic cru for Brunello di Montalcino. Pure Sangiovese grapes, aged for 30 months in French oak barrels, followed by a further refinement in bottle for at least 18 months. Brunello of great softness, roundness, lightness. THE WINE Brunello di Montalcino 'Vigna del Lago' by Val di Suga is made in the area the coldest part of Brunello, the last to be harvested. Historic cru for Brunello di Montalcino. Pure Sangiovese grapes, aged for 30 months in French oak barrels, followed by a further refinement in bottle for at least 18 months. Brunello of great softness, roundness, lightness. THE WINEYARD The northern slope of Montalcino didn’t use to be covered in vines, but was farmed with cereals, olives and cherries. In this area influenced by the Apennines, the seasons are more distinct, continental and the north wind significantly lowers the temperature in winter. Therefore it is the coldest Brunello area in this season, but also the wettest . This northern slope is a gentle hill: a feature more reminiscent of the Crete Senesi area, right next to it, than the two more rigid, steeper and warmer southern slopes of Montalcino. The climate and origin of the soils make this area of Montalcino the last to be harvested . Vigna del Lago is the vineyard that welcomes all the visitors arriving from the north of Montalcino. It gets its name from the lake surrounding it which plays a fundamental role in the microclimate in this area; the soil is a continual alternation between clay and strips of very fine galestro. THE COMPANY A company with a unique feature within the terroir of Montalcino, Val di Suga differs from the other local companies for its famous three vineyards located in the three exhibitions of Montalcino. Three vineyards in essence, marked by deeply different characteristics: Vigna del Lago is exposed to the north, Vigna Spuntali is located to the southwest and Poggio al Granchio is located south-east. A difference therefore unique that of the company belonging to the Bertani Domains group compared to the others operating in Montalcino, that of being able to count on completely different vineyards from them and can therefore produce three types of Brunello that are equally different. The winery, located north-east of the municipality of Montalcino, is part of the original complex now renovated and reorganized with a new underground barrique and has a total area of ​​120 hectares, of which 55 are planted and cultivated in Sangiovese. Val di Suga's added value lies in the diversification of being able to offer three variations of Brunello which are the perfect representation of three great crus, where the evolutions of Sangiovese are expressed in the totality of wines that are real cult of wine Montalcino. Before 60,00 € tax incl. Tasting Color: light garnet with very bright ruby-orange reflections. Bouquet: notes of fresh cherry, violet and candied fruit. Taste: elegant, subtle, soft, with a large volume but with an unmistakable lightness velvety tannins. 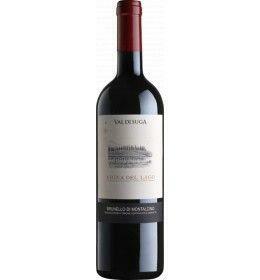 The northern slope of Montalcino didn’t use to be covered in vines, but was farmed with cereals, olives and cherries. In this area influenced by the Apennines, the seasons are more distinct, continental and the north wind significantly lowers the temperature in winter. Therefore it is the coldest Brunello area in this season, but also the wettest. This northern slope is a gentle hill: a feature more reminiscent of the Crete Senesi area, right next to it, than the two more rigid, steeper and warmer southern slopes of Montalcino. The climate and origin of the soils make this area of Montalcino the last to be harvested. Vigna del Lago is the vineyard that welcomes all the visitors arriving from the north of Montalcino. It gets its name from the lake surrounding it which plays a fundamental role in the microclimate in this area; the soil is a continual alternation between clay and strips of very fine galestro. A company with a unique feature within the terroir of Montalcino, Val di Suga differs from the other local companies for its famous three vineyards located in the three exhibitions of Montalcino. Three vineyards in essence, marked by deeply different characteristics: Vigna del Lago is exposed to the north, Vigna Spuntali is located to the southwest and Poggio al Granchio is located south-east. A difference therefore unique that of the company belonging to the Bertani Domains group compared to the others operating in Montalcino, that of being able to count on completely different vineyards from them and can therefore produce three types of Brunello that are equally different. The winery, located north-east of the municipality of Montalcino, is part of the original complex now renovated and reorganized with a new underground barrique and has a total area of ​​120 hectares, of which 55 are planted and cultivated in Sangiovese. Val di Suga's added value lies in the diversification of being able to offer three variations of Brunello which are the perfect representation of three great crus, where the evolutions of Sangiovese are expressed in the totality of wines that are real cult of wine Montalcino.